Beyond the hashtags. Saris everyday. Sari: a two-syllable word that conjures up the warmth and vibrancy of a people who continue to wear a garment that was first woven and worn during the times of the Indus Valley civilization. It’s not news that recent sari pacts on social media, transcending geographical borders, have worked wonders for the resurgence of this unstitched piece of cloth. The ether is saturated with photos and stories of women who wear, showcase, and share their knowledge of saris and in the process encourage others to imbibe and follow suit. It’s a commercially encouraging trend for the weaver, and if they’re an influencer or collector, to the wearer too. But this story is not about all of that hashtag celebration. This is about the everyday women who go about their chores in a sari. More than any Internet campaign, these women are the reason the sari has stood the test of time, travelling from ancient history to the modern day. The year was 1992. I was twenty-two and working in Chennai (then Madras). It was an easy city to fall in love with: All those overflowing flower stalls, stucco-walled temples with rainbow coloured gods and goddesses, and the intricate kolam drawn on freshly swept streets sprinkled with water. The fragrance of earth mixed with drops of water would mingle with camphor floating from the temples, hinting also at the sweet scent of jasmine tucked in dark tresses – all of this was enough to infuse the magic of this vibrant city in me. Life’s travels, however, took me away from Chennai, and I didn’t find myself back there until twenty-five years later, in August 2017. My friend Ambika and I were on a trip to Tamil Nadu. Armed with a camera, I was excited to re-visit my old fond memories here. Our first meal after we landed in Chennai was at Annalakshmi on Mount Road. The goddess at the foyer here stood resplendent, dressed in the finest Kanchivaram silk sari, shimmering in pink, orange, and gold. I would come across more examples of Kanchivarams and their exquisite craftsmanship over the next few days in stores and draped on temple idols. 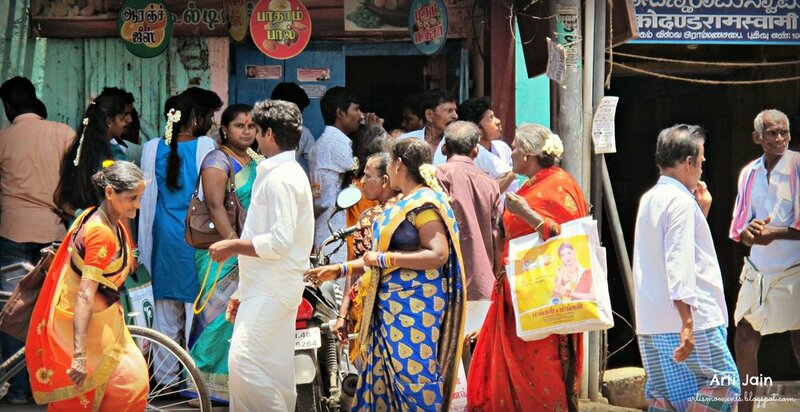 But this weave, synonymous with traditional silk saris of Tamil Nadu, is largely unaffordable for the common woman on the streets of Chennai, who might usually find the price and durability of synthetic saris more accessible. While the Goddesses shine in silk saris woven by hand, the women who worship them drape their best factory produced synthetic copies, comb their hair, tuck a few strands of jasmine, line their eyes with the darkest mayyi, fix their bangles and bindis and get ready for darshan. As the setting sun set alight the brightly coloured buildings around Mylapore’s Kapaleeshwarar Temple tank, we grabbed hot vadas with chutney. A few moments of calm before entering the area’s rush hour traffic give way to priceless little observations: Of how the ancient and modern sit side by side in India. Computers compute horoscopes. Ayurveda continues to heal. We journeyed on. Early next morning, our train deposited us at Madurai station. On the way to our hotel, we drove past the River Vaigai. The dry riverbed told two starkly different stories. On the one hand, it reflected the state of Tamil Nadu’s dwindling rivers, but on the other, it offered a glimpse into the resurgence of Sungudi sari dying, with its vast, empty terrain being used to air-dry the freshly dyed saris. I was torn between the sadness of the river and the joyous colours of the saris. Later, as Ambika and I wandered through the Madurai Meenakshi Temple complex, and marveled at its splendour, I spotted a group of women. Their ancestors had moved to Madurai from Rajasthan, and they spoke Hindi so I could talk to them comfortably, taking pictures of their colourful traditional Marwari attire of lehenga, choli, and odhni, and their equally colourful smiles. 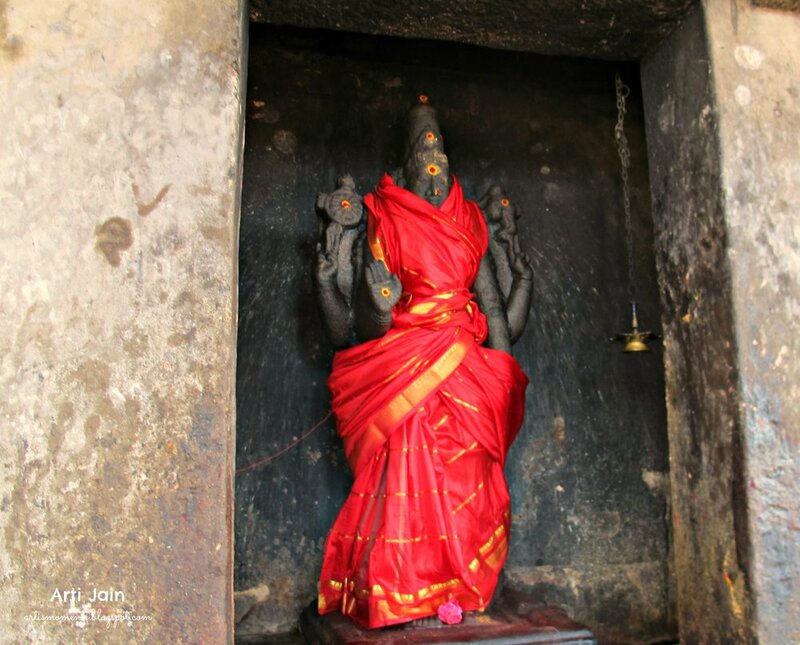 The next day, we reached Thanjavur, and went on to visit the Brihadisvara temple. The 11th century Shiva temple, built by Raja Raja Chola, is a UNESCO heritage site. 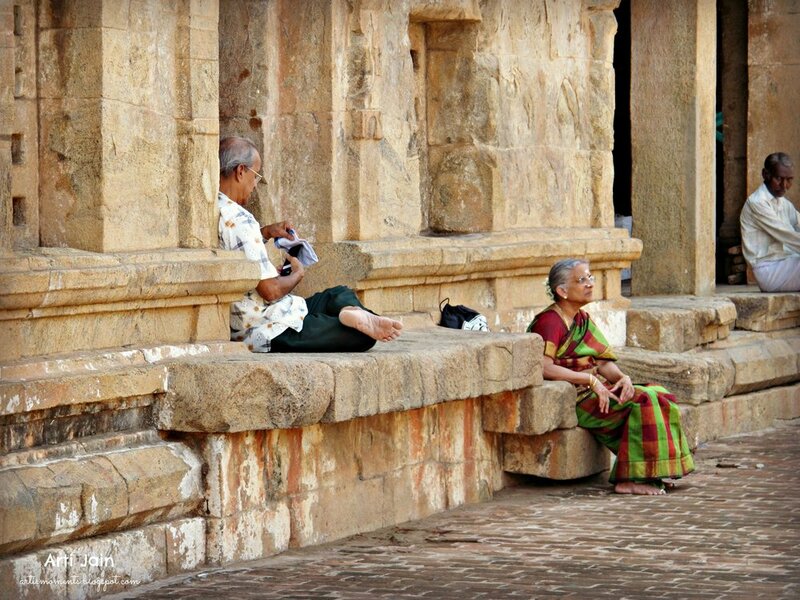 Clicking pictures of the structure, I noticed how the people who visit these temples became a part of my frames. Their fluid clothes, gestures, and expressions merged with the solid structures around them, composing a symphony of history. There was a couple there on pilgrimage. The lady was pleased to see that I liked her sari. “Madras check.” She informed me. A little while later, my eyes met with a group of women, who saw me with my camera. Actually, I’m not sure who spotted whom first. Perhaps I heard their chirpy chatter before they saw me. They were on a pilgrimage from Andhra Pradesh. A young gentleman travelling with them told me that they wanted me to take their pictures. I was thrilled. Their saris were not handloom cotton or silk, but machine-made synthetics. Their exuberance, however, was as close to organic and homespun as possible. These are the women who wear only saris, every day. Thanjavur is considered the rice bowl of Tamil Nadu. We stayed at a homestay in the outskirts of the city, nestled between lush green paddy fields punctuated by coconut groves. We visited the local temple and the local potters’ community on a bullock cart. It was on our way back, that a lady in a blue sari thumbed our cart down, asking for a lift. Her sunny smile hid the fact that she’d just finished an eight-hour shift at a construction site. She was now on her way home to prepare the evening meal for her family – hers is yet another story of an almost single mother (with an alcoholic husband), neatly folded in the pleats of her daily grind. Soon, we were at the end of our Tamil Nadu trip. But Chennai had one last treat up its sleeve for me: Dakshina Chitra. This living museum of art, architecture, crafts, lifestyle and textiles showcases India’s southern states in a most aesthetically pleasing way. These silk saris from Tamil Nadu, hung overhead and caught my eye as I passed a weaver resting at his loom. Back at the airport and waiting for my flight back to Doha, I was flipping through my camera’s captures. They filled me with hope— in a city where even Mother Mary drapes a shocking pink sari for Sunday Mass, the future of the sari is secure. The challenge, however, is to keep the traditional crafts alive. My hope is that both factory-made and handmade saris continue to flourish side by side. While the former make inherited designs and the drape itself more accessible to people of all means, the latter keep our weaving traditions, craftsmanship, and living cultures vibrant. Arti Jain is a full-time observer of life. She blogs, makes photos and writes short stories.